Hey there! 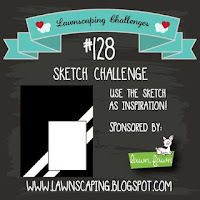 I am playing the Lawnscaping 'Sketch' challenge from Lawn Fawn today! 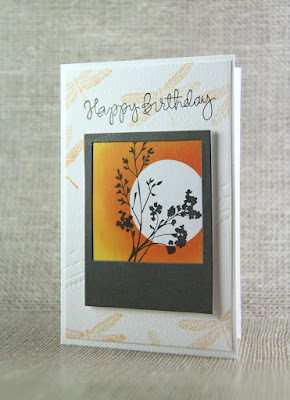 I am also playing the Simon Says Stamp flickr 'ink blending' challenge today. To make this card, I masked off a square apnel with post it tape and created my scene by ink blending Mama Elephant yellow ink and Memento 'Tangelo' ink. (I used a circular mask too). I then stamped my foliage (from Inkadinkado). I used the polaroid diecut from lawn Fawn to frame my scene. To add interest, and to keep to the sketch, I dry embossed paper Smooches dots and dashes die on the base panel in an diagonal. To finish, I stamped some dragonflies on the background and popped up the polaroid panel with some fun foam. I also added the birthday sentiment from Simon Says Stamp. I really enjoyed making this card!